Many great buildings begin as one man and one woman’s dream. Gold Mountain Manor was built in 1928 by Los Angeles movie investor Alexander Buchanan Barret and his wife Bessie, a daughter of a Civil War veteran. They commissioned Guy Sherman Maltby, a local contractor and owner of the Bear Valley Milling and Lumber Company, to construct their mountain home. Maltby was an easy choice for the Barrets – he had a hand in bringing luxury to the Big Bear Valley and built the Peter Pan Woodland Club – an exclusive members-only resort built in the vein of all the great lodges of the day featuring four stories, a golf course, two mineral hot spring pools, a gymnasium and private bridal paths. When completed, the Manor was Maltby’s grandest accomplishment and featured 10 bedrooms, two baths, maid’s quarters, and below the main floor Maltby included a wine cellar, three deluxe donkey stables, a carriage room and a tack room. 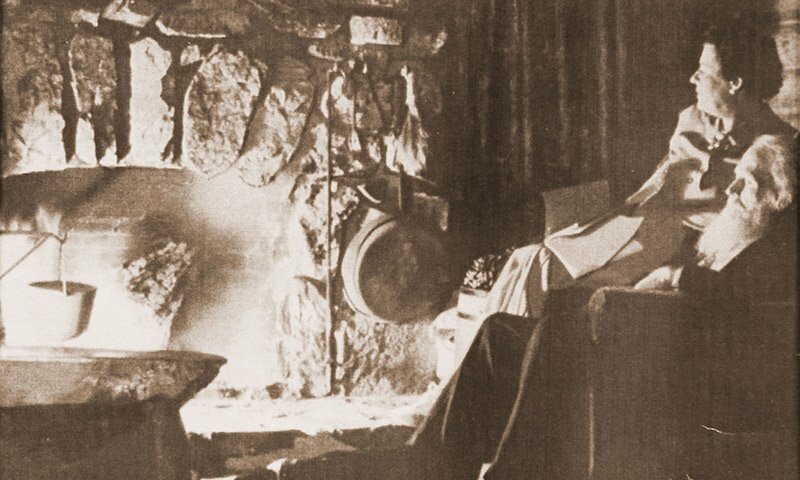 Mr. Maltby used local materials such as hand-hewn pine logs and red rock quartz mined from Gold Mountain to construct the grand fireplace in the center of the Manor. If you look closely, you can still see the flecks of gold in the quartz. The Barrets quickly settled in, inviting friends and family to visit them in their new mansion. Their guest list often read like the “who’s who” of Hollywood, and their home fast became a celebrity hideaway. During quieter times, Bessie spent much of her day tending to the grounds. She cultivated her green thumb over the years and became a skilled gardener. As you stroll through the grounds, Bessie’s old blaze red rose bushes, towering pink hollyhocks and ample purple lilac trees still bloom each spring. Under Cathy’s tutelage the garden still flourishes much like it did under Bessie’s charge. 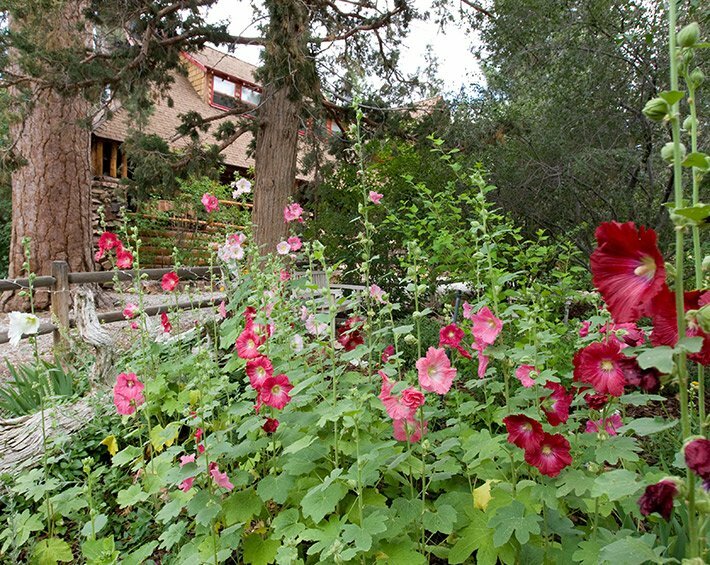 Alexander and Bessie’s beloved mountain retreat – they named it Murmuring Pines – was converted in the late 1970’s with careful authenticity into today’s Gold Mountain Manor. The Manor still sits on its early footprint. Inside, original chandeliers illuminate the dining area and hand-painted stencils decorate the ceilings in a few of the guest rooms. Some of the original spaces, such as the carriage and tack rooms, three of the maid’s quarters, and the chauffeur's quarters have been converted into beautifully tactile rooms with architectural interest. 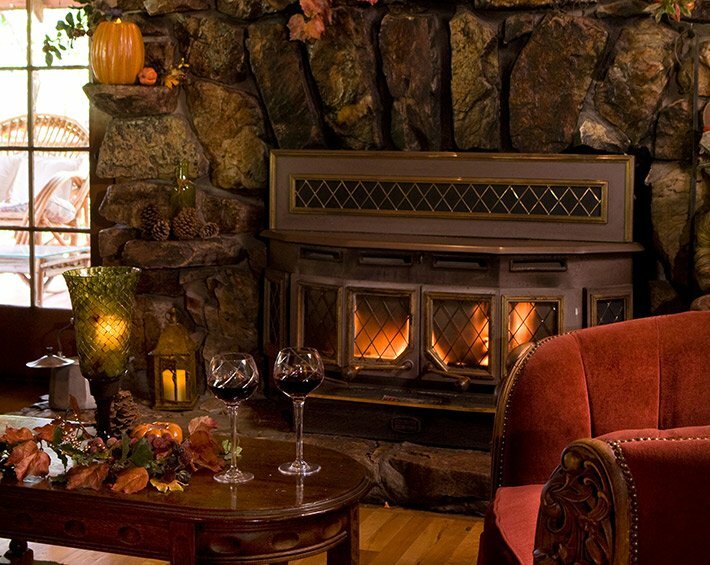 We invite you to remember simpler and more romantic times during your stay at our Big Bear lodging. It is a privilege to own or to stay in a one-of-a-kind place of history. 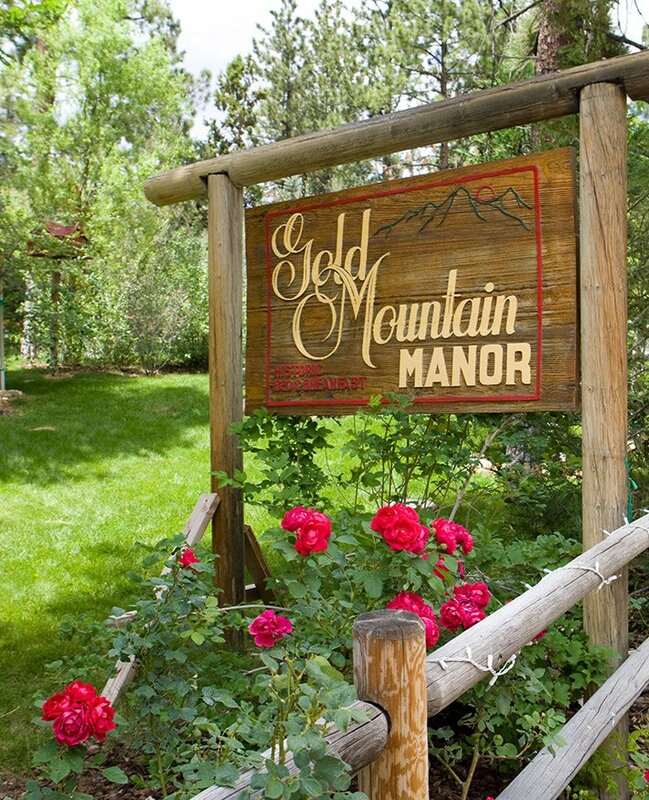 Every owner has contributed a bit of their vision to create the Gold Mountain Manor Historic Bed & Breakfast. After the Barretts built their home, the original Manor, and entertained Old Hollywood (Clark Gable and Carole Lombard), they sold to Miss Mason. She bought the Manor to use for church retreats, girl scout camps, and during World War II, she allowed soldiers on leave to sleep on the front lawn. The iron “flower bed” at the side entrance is one of her originals. She was tiny in stature, but her heart was huge. Then came the Nelsons: Helen Nelson loved “Murmuring Pines” so passionately that used to have her husband Al, drive by all the time. Finally she convinced him to approach Miss Mason to see if she would sell. She did, and he bought it for their large family, including seven children. Al built the wooden check-in bar and restored Murmuring Pines to its original glory. Every night the neighbors would stop in for a cocktail and hors d’oeurves. Their daughters have stories of first “kisses” at the bottom of the chauffeur’s stairs before sneaking back inside to their rooms. When the Nelson children moved away, Lynn Montgomery, an Emmy Award winner in set design and script writing, rewrote the “Manor’s script” and turned Murmuring Pines into Gold Mountain Manor Bed & Breakfast. It still sits on the original footprint, only some of the 10 bedrooms were made into bathrooms and some special service rooms were made into suites. Montgomery themed the guest rooms, stenciled walls and ceilings and gave it some more character but still kept the original footprint and the old Big Bear mountain feeling. Since she hailed from Hollywood, more celebrities came to stay and more stories were written. John and Connie became the next stewards of Gold Mountain Manor and hundreds of commercials, photo shoots and films were shot on the grounds and in the Manor. Many couples who married here from that era continue to return to stay - often with children and grandchildren in tow. Celebrities such as Kenny G stayed then and he recorded his Holiday album here. Even Alex Trebeck of Jeopardy fame was entertained by John and Connie. Next up were Bob Angillela and Jose Tapia, who modernized several rooms and created bathrooms from some tiny bedrooms. Their time here was a labor of love and were widely known for their gracious hospitality and their terrific pancakes! It wasn’t easy to follow in their footsteps, but Trish and Jim Gordon did just that with special touches. They added decorative flair, and created the beautiful Cozy Pine suite from two of the maid’s quarters. Their culinary background allowed them to create delicious recipes still in use at the Manor today. Then Cathy Weil came on board. She saw all the love each of them put into the Manor and enhanced it. With a great love of the outdoors, she created a magical “Secret Garden”, stone pathways, a meditative, reflective area, flowers galore and planted more than 100 trees and bushes. She envisioned the pine branch arches, the hundreds of twinkling and market lights and she created the different “outdoor rooms” within the one acre property. Her visions soon found the perfect wedding spot for hundreds of brides and grooms. Her decorative touches indoors and out, along with expanding the menu make for a very memorable experience. Cathy’s warmth and attention to detail have helped create memories for so many couples, best friends and families. Come and stay at the Manor. You, too, will become a part of the fabric that is woven into Gold Mountain Manor. The legacy continues with you.